Over the past several years, Facebook ads have gone from being a new notion to representing the largest market share of online display ads. eMarketer recently published a report projecting worldwide social network ad revenues to grow by the billions. Over a four year period from 2011-2014, social network advertising is expected to grow from a $5.2 billion industry to a $11.87 billion industry. Of the projected $7.72 billion of social network ad revenues, 47% is anticipated to come from the United States. Facebook is expected to account for 68% of this revenue. That translates to an expected $2.47 billion of ad revenue generated purely from Facebook in the United States. From there, Facebook’s ad revenue in the United States is expected to increase to $3.31 billion in 2013 and $3.75 billion in 2014. Savvy marketers have been early adopters of Facebook ads, understanding that Facebook is both where their target market spends the majority of their time online as well as its offering of unprecedented targeting. Marketers are able to direct their efforts towards users’ activities on Facebook, recognizing the ability to draw from an almost limitless source of knowledge about users like where they’ve travelled, what they Like, where they live and what music they listen to. Marketers are focusing their efforts on using the behavioral information available on Facebook to target specific audiences. comScore found that 73% of ad impressions focused more on behavioral habits, rather than age, gender and household income. This marks a huge transition from previous targeting methods by advertisers, where they had to focus much more on broad ranges for age (and sometimes gender) when advertising on the radio and television. Even when it comes to traditional display ads on publisher sites, as we’ve highlighted before, you can’t guarantee you’re reaching your target audience. These trends are not expected to stop anytime soon. comScore just released a report on the digital future in 2012. In 2011, Facebook accounted for 16.6% of all time spent online, and should overtake portals as the most engaging online activity in 2012. 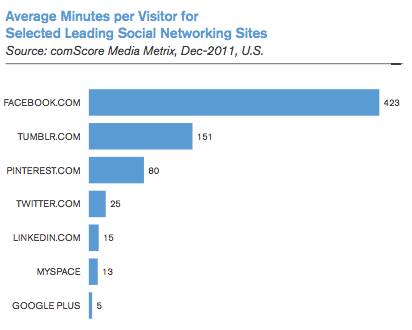 More impressive is the number of minutes Facebook users are spending on the site: 423 minutes on average in December 2011, highest by a wide margin of social media sites. In a testament to the value that marketers are seeing on Facebook, 1 out of every 4 online display ads is on Facebook. 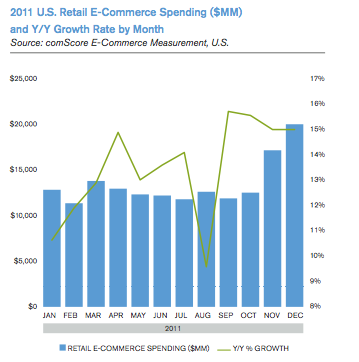 Driving some of this ad spend is the continued rise of e-commerce. Even under the economic uncertainty that plagued the US for the past few years, e-commerce grew steadily and last year hit $256 billion — a 12% increase from 2010. Customers are embracing this form of shopping, be it buying from their favorite department store online or feeling the delight of discovering a relevant deal from a company like LivingSocial or Groupon. What stands out to you most in these numbers? Let us know in the comments!